MADISON, Wis. — Dozens of 17-year-olds voted illegally across Wisconsin during last spring’s intense presidential primary, apparently wrongly believing they could cast ballots if they turned 18 ahead of the November general election, according to a new state report. Some political campaigns were also spreading false information about eligibility, the report said. The Sanders campaign specifically was sending out national messages on social media about 17-year-olds being able to vote in presidential primaries, Magney said, although Wisconsin election officials didn’t see any misinformation from that campaign about Wisconsin. Sanders campaign officials didn’t immediately respond to an email Monday seeking comment. 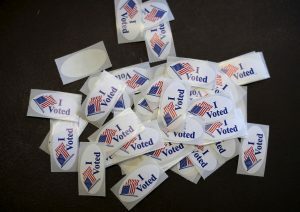 Left: Stickers are seen on a table at a polling stations for the Wisconsin presidential primary election in Milwaukee, Wisconsin. Wisconsin Elections Commission staff say dozens of teenagers voted illegally across the state last year, wrongly believing they could cast ballots if they turned 18 ahead of the November general election. Photo by REUTERS/Jim Young.